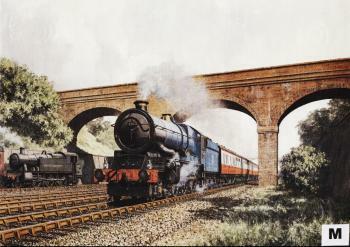 The ghost of the Great Western sings the blues as 'King' Class 4-6-0 No. 6023 King Edward II, in the new standard BR livery, roars through Sonning Cutting, near Reading. British Railways faced many pressing problems on 1 January 1948, the first day of its existence. What colour to paint the trains probably wasn't the most acute of them but it does seem to have received an inordinate amount of attention over the succeeding months. Providing a colour-coded identity for the six new Regions which replaced the Big Four railways seems not to have been a difficulty, and all was ready on the big day. Finding a new livery for the trains took considerably longer. A mere 30 days after nationalisation senior BR officials watched an unusual beauty contest at Kensington Olympia. Paraded for their inspection were four Class 5MT 4-6-0s each painted in different colours - three in the various shades of green used by the Great Western, London & North Eastern and the Southern Railways and one in black. Also on display were an SR electric locomotive in blue and various electric multiple units and carriages in other proposed liveries. No decision was taken immediately but a number of experimental liveries were applied to certain trains to test public opinion. These included dark blue for the most powerful express passenger locomotives and apple green for the other express engines. Carriages were decked out in colours whose official descriptions sounded like something off the sweet trolley - plum and spilt milk or chocolate and cream. The last named - the traditional and much loved colours of the Great Western - contrived perversely to appear on a Glasgow to Aberdeen train. The public, still labouring under rationing and a general air of post-war austerity gloom, seem not to have cared either way. Other new liveries were tried and more beauty contests were held - all to a wave of apathy from travellers. Eventually, at the end of 1948, a range of standard liveries was fixed: light blue for the highest powered express passenger locomotives; a darker green (actually Brunswick green, an old GWR colour) for other express engines and black for everything else including the few diesel and electric locos. Carriages were in the rather startling combination officially titled carmine and cream but always irreverently referred to as 'blood and custard'. Local trains and non-passenger vehicles were red and electric multiple units green. King Edward II looks a little surprised by his new robes. Introduced in 1927, the first of the GWR's most powerful 4-6-0s was heralded as 'the King of railway locomotives' by the company's publicity machine. They reigned supreme in the front rank of Western motive power for over 30 years and when displaced by diesels in 1961/2 they went quickly and with dignity. Three are preserved including No. 6023 which was rescued in 1985 by Harvey's of Bristol, after it had spent more than 20 years in a scrapyard. That lamenting GWR ghost quickly got its revenge; in 1951 it was decided that blue didn't wear well and it was abandoned in favour of Brunswick green which was extended to all express passenger locomotives, including the 'Kings'. Five years later chocolate and cream was revived for named Western Region trains. The return of the GWR was complete!